Foundation is a product which many of us struggle with. It is either the wrong consistency, wrong colour, dries your skin out or is too oily. The Rimmel Match Perfection is aimed more at people with dry skin, it is very moisturizing but is also long lasting. One of the things that really did stand out for me is that is does not cling onto dry patches at all. It does take some blending when first applied because of it's moisturizing agents, brush strokes are quite apparent so more blending is required than other foundations i've used. I have pale skin and I have always gone for very pale foundations, but I find it can wash me out and make me look almost ill. With this, I wanted to find a darker foundation that didn't go orange on my skin, the picture doesn't do this foundation justice as i can honestly say it has no orange tinge to it and actually gives a very nice "healthy, holiday glow" to the skin. 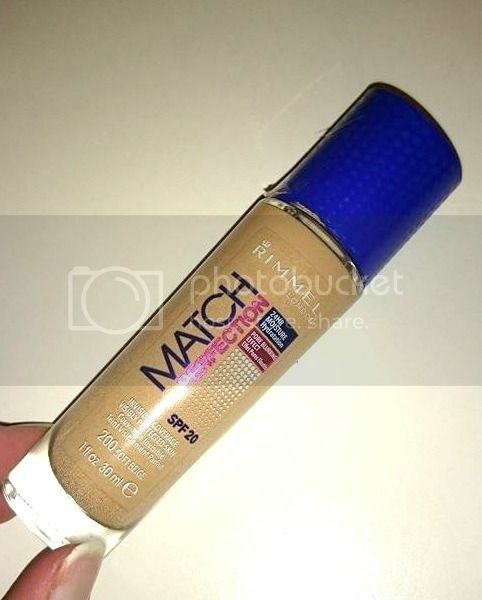 One thing I did notice about this foundation is it claims to minimize pores which i do not agree with, in fact without been powdered they can be very obvious. That leads into my next negative, as I have started trying this out in winter, it maybe too dewy for me and it requires quite heavy powdering in order to build up the overall look and give it a more matte finish...I can imagine in summer this not been the case though and would be fine without powder. Overall I do like this foundation giving it a 7/10. I will carry on using it and it's possibly one i'd even repurchase, mainly for the good colour match as been pale i'd usually struggle going darker without it having an orange cast to it. Not good if wanting a matte look.